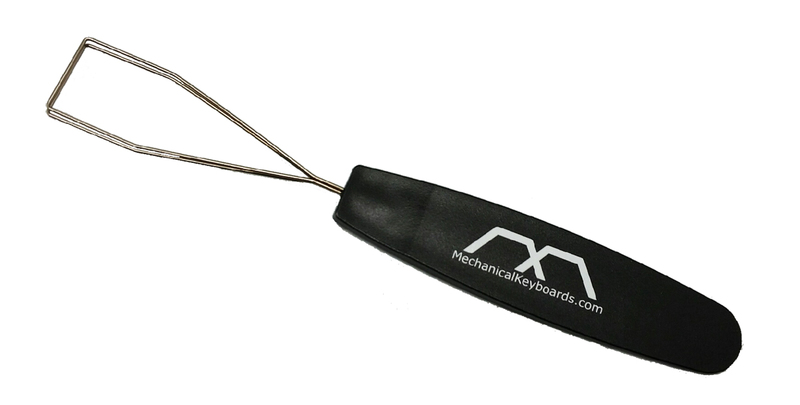 This high quality wire style keycap remover from Mechanical Keyboards Inc is a must have for any mechanical keyboard owner. Wires on the tool can bend outward to fit onto mechanical (and other) keycaps. The keycap puller holds up to 4 1-unit keys to speed up key removal. Compatible with with most mechanical keyboards including Cherry MX, Alps, and Topre switches. The bottom portion of the handle features a flat tip that assists in case opening. Simple wire keypuller. Works great. Handle is flat, so the item doesn't take up much space. I can slide it between stuff on my shelves in order to store it. Excellent puller. The best part was the ability to remove 4 keys quickly without the need to empty the puller.